So when I was invited to take part in the Argos Colour Campaign 2014 I eagerly accepted the challenge - to create a Moodboard for a room? absolutely! 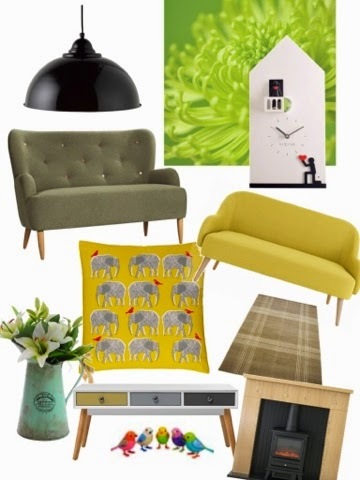 I've created my living room Moodboard based on sunny yellows and calming greens with items available from Argos - this wasn't a condition to the comp, but with such a wonderful range, I didn't struggle with any element of my room - everything you see can be found at Argos! My favouritest items? The green habitat sofa with colourful buttons, the elephant cushions and the Romeo and Juliet cuckoo clock! A cozy rug and a fireplace is perfect to snuggle up on one of the sofas and I love the colour drawer details on the table. If you like my Moodboard for a living room, please do comment - I've got everything crossed as the winning board wins a £500 Argos voucher! Yey! Wow! I love that elephant cushion :-) Good Luck!